Today we're going to take a look at using a dark colored primer and how that affects painting your model. 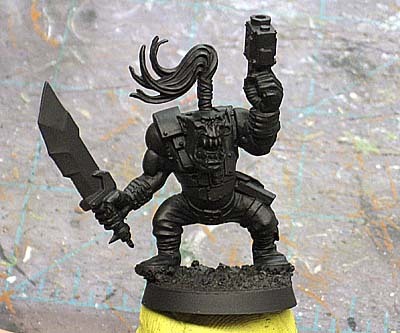 Using an Ork as our example, I'm going to paint him (this is my first Ork by the way!) by sticking to simple techniques like base coating, washing and highlighting. Nothing fancy like wet blending or any other "advanced" techniques. The real beauty of using black for your primer is that all of the deepest recessed areas start of being painted for you. You don't have to worry as much about missing a spot as you had to with white primer. The trade off is that you colors can darken up a bit and not keep their brightness as they would on a white or even light colored primer. We start off with the "inside" parts once again. In this case, it's going to be the eyes and tongue. We don't want to paint the face and then try to go back and paint these tiny areas later on. It would be way too tough for a model like this especially if we were doing an assembly line approach for a squad of these guys. You don't have to be neat either, you can clean up around the area when you're done painting them. Once you have your basecoat down, it's a quick wash and you're done with these elements. I went with a red for the eyes and tongue and my wash was GW Thraka Green. At this scale, the green makes the recessed areas look dark without killing the color entirely like black would have a tendency to do. Next up are the teeth. Two basecoats and these are done. The first with a dark brown the the second with a light tan color. Just remember to leave a little bit of the first color showing around the edges when you paint the second color. 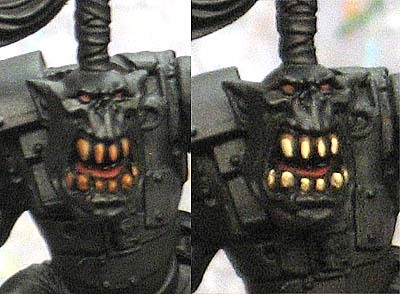 TRICK: Taking the extra minute or two to pick out the teeth instead of drybrushing across the face allows you to add some much needed detail to the model's face and make it a focal point. While it might add an extra minute or two, it can really help bring the model alive in the end. And last but not least are the "black" areas on the model like his hair and boots. To get those parts finished, it's nothing more than cleaning up any stray marks and then line highlighting the key spots with a dark grey color. In the case of his hair, I picked out a few starnds near the top knot. Not every hair, just a couple to suggest a highlight. For his boots, I picked an outer edge or prominent feature on them and highlighted that part. And for his fingernails, all I did was hit each one with a quick brush stroke of grey to make them stand out a bit. There may be as many different formulas for painting Ork skin as there are Ork players. 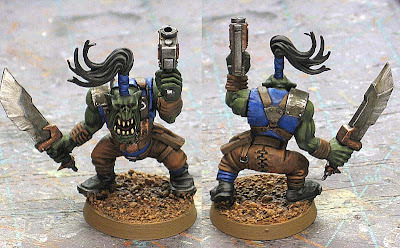 Since I've never painted an Ork before, I'm going to keep this simple as well. 1. First we start with a dark green for the basecoat. 2. Follow that with a GW Thraka Green wash to dark it a little bit. 3. 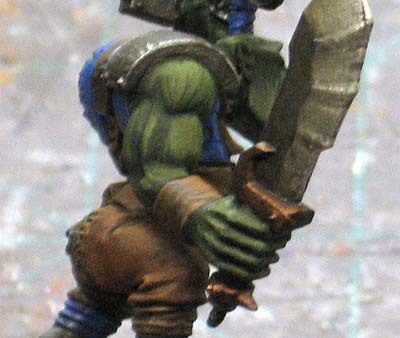 Come in with a slightly lighter shade of green and line highlight the muscles on this guy. This was the most fun part. You don't have to worry about being exact here. Just follow the shape of the muscles and use a series of repeating lines making sure to leave the recessed areas dark. You can see on his arm how the highlight is nothing more than the strokes that sort of define his muscles. Next we tackle the leather portions of the model. I have a formula I use for leather that I'll include here. 1. First we basecoat all the leather areas. I've used two colors here, one for his pants and one for all the other "leather" elements on him... it's Mississippi Mud by Americana for the straps and all things not part of his pants. 2. With your basecoat dry, it's a wash of GW Devlan Mud. 3. Once that dries, make another pass with the Devlan Mud. If you want to add any more contrast at this point, you can touch up key spots, but it's not necessary. Then it's a pass with GE Gryphonne Sepia to finish it off. 4. Add the highlight to the leather areas with Nutmeg by FolkArt. I used this color on both leather colors because I was moving quick. When it comes to highlighting, you only need to hit the upper edges of the leather straps and the most prominent folds on his pants. Up next is the metal areas. I used two metals on this guy, a silver and a bronze. I actually used two shades on the blade of his weapon to show that it's been sharpened. I used a gunmetal color on the flat surface of the blade and a brighter silver color along the edge where it's bee ground down to an edge. 1. Basecoat your metal areas. 2. Wash them with GW Badab Black. Do this twice. 3. Go in with GW Devlan Mud and add it to most areas. You want to give the surface an even look with some areas brown and some just blackened. This is to show grime that's built up over time. With the washes dry, you can take your bright silver and go in and show wear and tear along the edges of the armour and weapons. Where I painted bronze, I simply went back in with the original color and did some quick edge highlights. 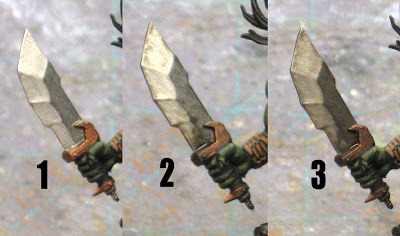 TRICK: When adding your final highlight to your weapon blades, try and keep your strokes short and straight if you're doing anything more than an edge highlight. You wouldn't have all kinds of curved lines flowing onto the blade. Nice short, straight strokes to show the edge has been chipped away at while being used. I chose a warm color for the base to contrast with the blue and green on the model. Keep in mind this was done with a few simple techniques like basecoating, washing, drybrushing and line highlighting. It just comes down to the order you do things in and how easy or difficult you make it for yourself. Something like this could definitely be done in an assembly line fashion in order to get a squad of guys done at once. 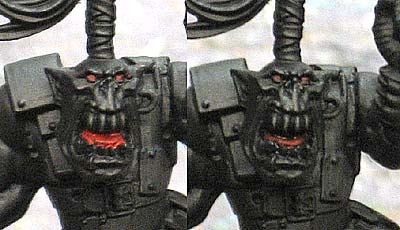 We haven't covered anything like battle damage, weathering or freehanding here, The idea is to show you how you can paint a model starting with a dark colored primer and use that to your benefit. 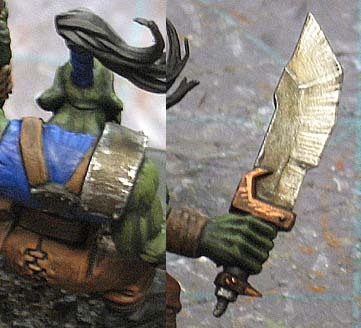 In reality we did touch on some weathering with how we went about highlighting the metal areas on the model. Just by varying your brush strokes, you can kill two birds with one stone. Hopefully this has helped and please go check out Dave's Tau that he's done using a dark primer. Thanks for the guide! Well written and thought out content. Great article! I'm about to paint some orks for my space crusade set. I'll definately use this technique. BTW, Ron did you do your write up with the Q&A with the Ultramarine movie folks? I'm afraid I may have missed it. Sleeping: Thanks, it's almost as much work to write the post as it is to paint the model. Jason: Unfortunately not, they haven't gotten back to me yet with the answers. I thought it was going to be on Monday (two days ago) but that's not the case. Thanks very much. I've only been back in the hobby for a couple months and the refresher on highlighting is most welcome. Thanks Ron now I have a base on where to start my wife's ork army. was a little off on how to do ork skin. 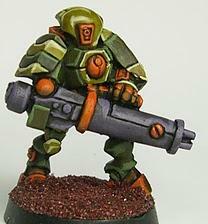 Nice Ork :) I'm not as happy with my Tau.. but with any luck, I'll never paint another one in my life... I forgot how much I dislike them. Dave: You may not like your Ork, but you'e one up on me.. I've never painted a Tau model. Have you got your next model ready yet? Sci-Fi is coming up!